Amazingly crafted cotton silk saree from Kolkata. The saree comes with 6.5 meter total fabric with blouse. First wash of the garment should always be dry cleaned. Kabita's Saree Collection, a pathbreaker in Bengal handloom, set up by Kaushik Biswas a decade ago in Kolkata, has grown from strength to strength from a very humble beginning. The brand KSC today is synonymous with innovation and elegance and represents the best of Bengal in the textile corridors of India, both in wholesale and retail. With his innovative designs, indepth knowledge in playing with textures and unique color concepts, Mr. Biswas has been able to bring forth a plethora of exclusive sarees for the discerning customer. His hands-on knowledge in the field of textile manifests itself in his weaves and designs and has found many admirers all over India.Kabita's Saree Collection, a pathbreaker in Bengal handloom, set up by Kaushik Biswas a decade ago in Kolkata, has grown from strength to strength from a very humble beginning. The brand KSC today is synonymous with innovation and elegance and represents the best of Bengal in the textile corridors of India, both in wholesale and retail. With his innovative designs, indepth knowledge in playing with textures and unique color concepts, Mr. Biswas has been able to bring forth a plethora of exclusive sarees for the discerning customer. His hands-on knowledge in the field of textile manifests itself in his weaves and designs and has found many admirers all over India. 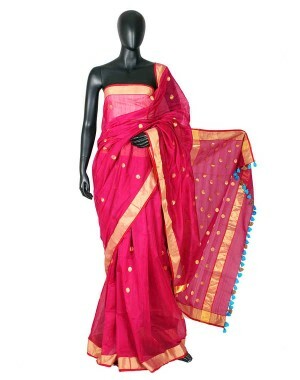 Combination of traditional craft techniques with modern-day designs, this pink silk cotton saree has been intricately hand-woven using zari knit and self-designed fabrics, that are inspired by the different shades of nature. The stunning collection is available in kabita’s saree’s collection. It is a 6.5 meter saree with a back knot blouse. The saree is vibrant and classy, and is perfect for today's urban woman.